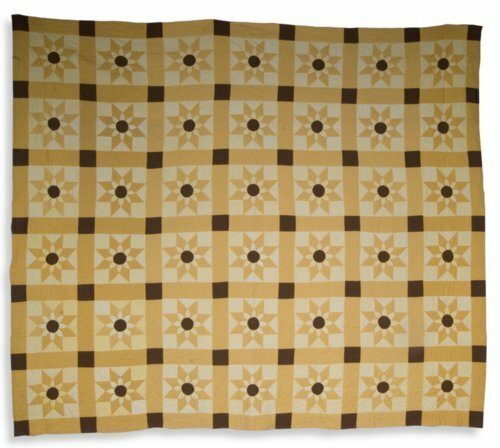 Yellow and brown cotton quilt pieced and appliquéd in pattern known as Sunflower, Missouri Daisy, or Star Dahlia. Quilt is made up of 42 blocks separated by sashing. Each block is pieced in two different shades of yellow/gold, with a sunflower at the center of an 8-pointed star. Flowers feature gathered petals radiating from a large, dark brown head. Quilted designs include outline stitching, grids, and leaves. Gold cotton backing. Machine-pieced and hand-quilted. Blanche Hovorka Eveleth made this quilt sometime around 1935 as a wedding present for her half-brother, Ken Hovorka. Both were born in Kansas but living in California at the time.